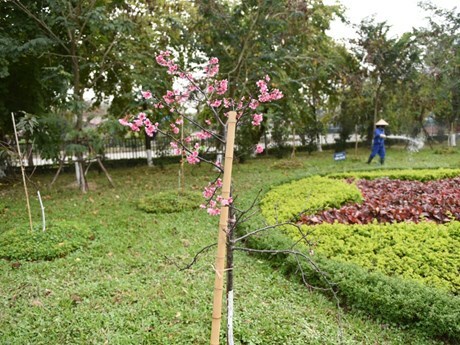 (Construction) - The Hoa Binh Park in Hanoi has been assigned to take care of over 1300 cherry blossoms trees since 2013 under cooperation programmes between Japanese partners and Hanoi city. Cherry blossoms planted at Hoa Binh park not only introduce the beauty of Japan to Vietnamese people but also signal the close ties between the two countries. Nearly 1000 plants have grown well and some even have first flowers right ahead of Tet festival, receiving warm welcome by local residents and visitors. Following the success of planting cherry blossoms at Hoa Binh park, more than 1000 cherry blossom trees will be presented to Hanoi by Aeon Mall Vietnam by February 23. As Japan and Vietnam have different weather and soil conditions, organisations and individuals in charge have applied numerous methods to keep the trees growing. Cherry blossom presented by Japanese partners in Hanoi in recent time begin to bloom ahead of Tet (or Lunar New Year) festival.